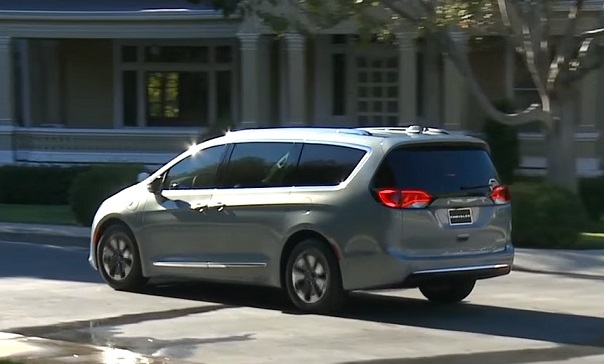 In America, the new chic minivan Chrysler Pacifica was presented at the Detroit Auto Show in 2016, replacing the Chrysler Town and Country. Design of new items made cars in the Chrysler 200. The new sedan style autotomy not only a modern design body and comfortable roomy interior, and a new platform, as well as a hybrid version of the Chrysler Pacifica Hybrid. 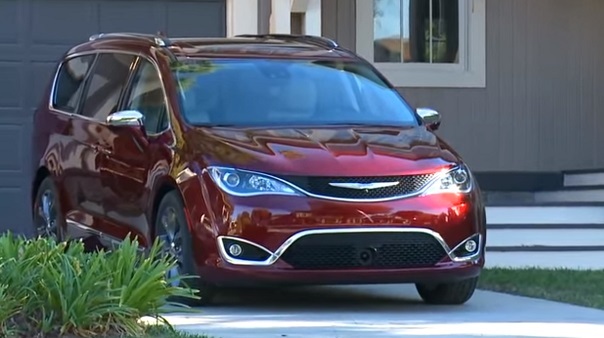 Home sales Chrysler Pacifica 2016-2017 model years in the United States is scheduled for the summer of this year at a price of 30,500 dollars. 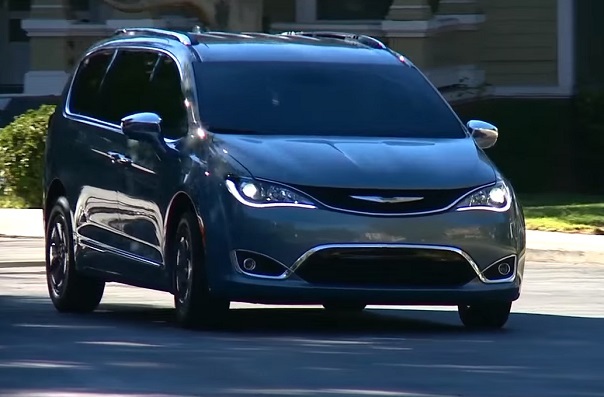 Of course, sales Chrysler Pacifica and Chrysler Pacifica Hybrid is in the Russian market so far, but still we hope that the new minivan will appear in Russia. Externally by similarity to the Chrysler 200 sedan new minivan looks stylish and dynamic. Very important! The large seven-seat body, (the option of a 8-seater) with smooth harmonious forms, sloping hood, the long sloping roof line to the stern and a large aft. In the front end developers have established a modern head optics with LED daytime running lights. Solid bumper with huge air intakes and fog lamps trim. A set of wheels ranges from standard to optional R17 R18-R20. Solidly attached to the body van vyshtampovki on the hood and sides, as well as an abundance of chrome. Aft of neat set with LED marker lights and filling the massive tailgate for easy loading. Dimensions Body Chrysler Pacifica 2016-2017 model years up to 5170 mm in length with a wheelbase of 3088 mm, width 2022 mm, height 1737 mm. 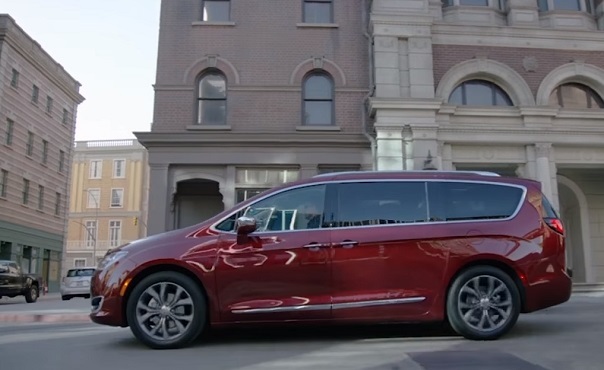 Chrysler Pacifica, built on a completely new modular platform Chrysler-Fiat Compact US Wide, which allows you to equip the minivan as a front-wheel drive Front Wheel Drive, and all-wheel drive AWD. The use of high-strength steel structure platform, as well as aluminum in the body structure and suspension reduced the car’s weight by 130 kg compared with the previous model, and now the mass of the new Chrysler Pacifica with the petrol engine is 1964 kg, and with a hybrid power plant 2242 kg. The three-row cabin Pacifica can comfortably accommodate seven people (a landing formula 2 + 2 + 3), and eight-possible version with solid seats in the second and third rows. When transporting bulky cargo third-row seats can be folded, not only, but also does away from the passenger compartment. Standard in complete LX new Chrysler Pacifica is equipped with climate control, electric windows and mirrors, a multimedia system Uconnect 5.0, eight airbags, modern instrument panel with a 5-inch color display, LED interior lighting, electronic parking brake, traction control system on top RV and ABS system stabilization. Optionally, a minivan can be equipped with three sectional panoramic sunroof with electric drive, adaptive cruise control, parking assistant and the automatic braking system, rear-view camera or a system of circular view of the instrument panel with a color 7-inch screen and multimedia Uconnect 8.4 complex with a color touch screen , sound system Uconnect Theater system, color 10-inch screens for the entertainment of the rear passengers, leather interior, electric front seats, rear sliding side doors and the luggage compartment, ventilated and heated front seats, and a huge list of electronic assistants, and security systems. Specifications Chrysler Pacifica 2016-2017 model years. Suspension fully independent from the Pacific (front MacPherson strut and rear mnogoryichazhka) disc brakes electric power steering. Chrysler Pacifica Hybrid with a hybrid power plant is equipped with 3.6 liter gasoline engine V6 power of 248 hp with a torque peak of 312 Nm and a dual-motor EV drive with a lithium-ion battery capacity of 16 kWh, which can be recharged from a conventional household network for two hours. One only electric hybrid version of the minivan can cover up to 48 km. Average fuel consumption of a hybrid power plant of 4.7 liters per 100 km. « New Seat Ateca 2016.